So they won the election; now what? Three months later and almost a month into Obama's presidency, as the nation is beginning to rub its sore, swollen eyelids and finally trying to focus on reality, it looks in the mirror and, with a shock, notices a gigantic hammer and sickle tattooed on its forehead, which clearly wasn't there before. The bubbling euphoric pulp has solidified into a depressing pile of unpaid bills and warrants. The computer has turned into a shovel and the big-screen TV into a 1930s-style radio, with the disciplined voice of Dear Leader calling for unity and sacrifice in the face of mounting economic hardships. 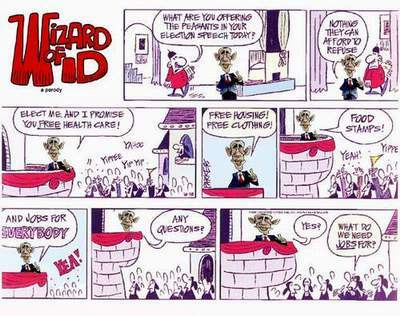 The only thing left unchanged is the Obama t-shirt with the magic word "change" on the chest. Being an immigrant from the former USSR - the land of equally redistributed misery - I used to cringe when Americans complained to me about the perceived misery and lack of opportunity under capitalism. I laughed at American homegrown agitators who were carping on behalf of "communities" about the lack of "economic justice." They sounded like ignorant, spoiled brats who hated their rich parents for giving them the car of the wrong color. The whiners either didn't realize how good they had it or they were being deliberately misleading. Either way their message was a fraud. I had witnessed the stagnation and the collapse of a centralized command economy that, in the absence of the markets, was fueled by the carrot and stick of coercion and stale motivational slogans. I had lived through the hyperinflation, when I had to pay a million rubles to a guy who fixed the rusty refrigerator in my kitchen. I had seen the old country plunge into the chaos of mass unemployment and crime, while it was being robbed to the bone by crooked unelected officials who profited from the corrupt scheme to merge socialism and capitalism - a half-baked brainchild of Clinton's economists who are now advising Obama. In other words, I had been at the end of this road and I didn't want to take it again. Like most other immigrants in America, I had discovered a treasure trove of opportunities and was able to provide a comfortable living for my family. I wasn't rich - but every time I would get into my GM car, turn on my HP computer, or watch a DVD from Netflix, I would give thanks for the perks that only an affluent capitalist society could provide. I didn't want any change - except, perhaps, towards fewer government regulations. But Obama managed to convince millions of Americans that they were so destitute and helpless that only a system of government rationing could save them from imminent starvation and homelessness. All of a sudden, previously self-reliant Americans found themselves in the position of neutered house pets, meowing and howling at the prospect of not getting their guaranteed three meals a day. Opponents of capitalism will tell you that market demand is created, not by necessity, but by sneaky marketing campaigns that generate a false perception of necessity. The same experts have now implemented this perverted theory by running a multimillion-dollar, Madison-Avenue-style marketing campaign, whose goal was to sell to the generally well-off Americans the notion that they were living in misery, poverty, and hopelessness - thus creating a false perception of a need for change. And change is materializing fast. Every time the new president opens his mouth, the market plunges. The banking crisis, which Obama used to get in power, was nothing compared to the post-election economic meltdown. On February 10 alone, after Treasury Secretary Geithner proposed a new economic rescue plan, the Dow lost 5% of its value. The unemployment is soaring while consumer confidence is sinking. Obama's aggressive marketing of perceived mass poverty became a self-fulfilling prophecy. As the shadow of the New Deal is darkening the horizon and the heavy steps of the approaching depression are sending tremors throughout the world, the appeal of Obama's plan is no longer in the eyes of the beholder. "I have almost no money, my wife is a shrew, and we live in a small apartment with seven unruly kids. It's messy, it's noisy, it's smelly, and I don't want to live." The rabbi says, "Buy a goat." "What? I just told you there's hardly room for nine people, and it's messy as it is!" "Look, you came for advice, so I'm giving you advice. Buy a goat and come back in a month." "It's gotten worse! The filthy goat breaks everything, and it stinks and makes more noise than my wife and seven kids! What should I do?" The rabbi says, "Sell the goat." "Life is wonderful! We enjoy every minute of it now that there's no goat - only the nine of us. The kids are well-behaved, the wife is agreeable - and we even have some money!" 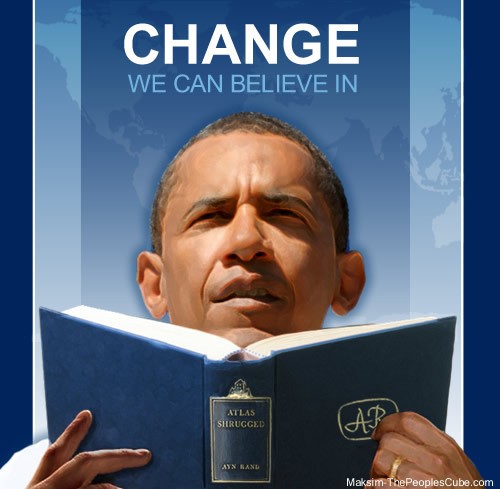 Obama's "change" is precisely the goat that Americans bought when they lost the appreciation of how good they had it. But the perception of misery is not set in stone; this self-inflicted disaster may as well serve as a remedy - an unpleasant but necessary shock therapy helping the misguided voters come to their senses and begin to appreciate what they had lost. And once they get rid of the socialist goat, they will hopefully regain confidence in their own system and continue to enjoy liberty and prosperity as they always did - with the head held high and without the silliness of feeling guilty about it. The trick is not to let the goat grow on you. Don't settle for socialism. Capitalism may be a self-regulating system, but it won't be able to heal itself if the socialization goes too far. Then it would be a whole different goat story. Also, it looks like someone forgot to add in some line breaks into the article. How about $1000.00 dollars for each year you fed the goat on time? Can dead people still feed the goat? I had several of them vote for the new regime, so I'm sure they are entitled to a check for previous feedings. Actually, that would be a good way to make money. Get a bunch of goats, go down to the local orphanage, abduct a few of those smelly unwashed brats, cook them up and feed them to the goats. Comrade Red Square, I have a friend who also fled the old Soviet Union back when Reagan was President. He tells me that he and his wife came to America with 4 suitcases containing everything they owned. In 20 years, he's earned a Doctorate in Engineering, his wife is a research physician and they are multi-millionaires. He's literally beside himself with grief and anxiety over what Obama has done to his new homeland. He tells me he's seen all this happen before. He wants no part of it. But there is no place left on Earth where he can run, now that America has become a Socialist disaster in the making. double plus plus good comrade...but could you use less words next time? I DENOUNCE Comrade Red Square for his lack of faith in the New Order. The collapse of the Soviet Union proves nothing! Likewise the collapse of all her satellite states, and the miserable, repressive, destitute equal condition of the remaining socialist states. It's only evidence that the great Socialist Experimenttm hasn't really come about yet. No one has the understanding of Marx and Lenin like we do now! We are the generation that shall see the true Workers' Paradise (patent pending) wrought forth from our own hands! What is it with the Leftist mentality that can't learn from History? It hasn't been 20 years since the collapse of the USSR, and still these idiots think Marxism is good for a healthy country and healthy society. This is lies. This filthy rabbi of satan did not explain the purpose for goat. When fighting holy wars, the Prophet (PBUH) would often enjoy the company of a goat. After a time (or two) the flesh could not be consumed nor the milk. This is by Allah's word. Though it is written it can then be sold to others like the impure kafir. Oh the joy the holy Prophet and his companions must have shared. This is how one finds happiness. Your foolish tales make a need to bang my head on the ground. If you should like a goat, I have..... at good price for you. It's obvious what went wrong with the goat. Comrades, this is the sad result of deregulation, lack of government oversight, and the failures of faith-based initiatives, e.g., taking your problems to a rabbi. You can't just buy a goat, take it home, and expect miracles. For crying out loud--that's the kind of failed thinking that destroyed the economy these past eight years! That's why we need a fully funded government program to oversee the goat. Instead of telling the man to buy a goat and leave it at that, the rabbi should have referred him to the proper government agency so he could apply for a goat, get the proper permits, undergo the required waiting period, etc. What's that, you say? There is no such agency? That figures. Well, I'm sure there must be one somewhere in Obama's new stimulus package. Think of all the jobs it will create! Also, the man obviously didn't know he had to milk the goat to get anything out of it (no doubt that's why the poor creature was breaking things and making so much noise). Again, that's the tried and false "you're-on-your-own" thinking of the Bush Administration that loved to inflict pain and suffering on humans and animals alike. Government intervention is clearly the only solution. In short, you'll get nothing from anything unless you milk it for everything. P.S. And the man only thought he was happy after getting rid of the goat. All the more reason he needs Obama--to tell him how miserable he really is! I only have enough goat-ration coupons for approximately one fifth of a goat. Do I get the same result bringing home a goat's head or hindquarters? Do I get 40 acres with my government appointed goat? "Loving the Stench From Tourists in the Morning"
LOL. Great picture, Maksim. But for Him to develop interest in this book, the shovel-wielding masses must first restore the glorious railroad infrastructure to the condition in which it was in the 1950s, followed by a few hundred passengers suffocating in a long railroad tunnel because it wasn't designed for trains pulled by old, coal-fueled locomotives. Without this literally happening, our progressive intellectuals will never understand the book's meaning. Just like the book's characters, they'll keep following in the current path towards the Common Good until everything around them is broken, and then they'll capture the last remaining capitalist and plead with him to help them, and if he sends them to hell, they'll start torturing him. That would be the torture they can believe in, because it's for the Common Good (since it'll help them to perpetuate their power of the masses). Waterboard John Galt! Waterboard John Galt! This capitalist drivel really gets my goat!!!! Brilliant, BRILLIANT post! I forwarded it to everyone I could think of. I wish some of those brain dead people on the Pajama Media would get a clue, but sadly, I think they'll have to experience it for themselves while dragging us along in the process. HEY YOU GUYS! Revolt over at CNBC. Go and join up! My people are on it, Comrade Commissarka. Expect another stimulating $13 in the mail for your services to the Party. I am in lockstep with comrade DDR Kamerad. This man who wrote this piece on the goat. What he doesn't understand, is yes, our chosen system of sharing and "equalization of opportunity" may have failed in the Soviet Union, China, Cuba, Cambodia, Vietnam, American Communes, General Motors, Ford, Chrysler, Cuba, and countless other companies and countries that have tried it, as well as in the fictional story, of Atlas Shrugged, but we can make it work here! I forsee the day when The One will have led us to such collective bliss, that when, in four years another leader offers us freedom, we will say: "Freedom, we don't need your stinking Freedom! We have one goat between the thirty of us, and that is enough for us! Give me the collective, or give me death! As for Mr. Galt, he can keep his stinking car, too! I would take an ox cart any day over a stinking car that runs on static electricity from the air! This modern technology is amazing. I accidentally found a site that features this story as a narration - and I can't even tell if it's a live person or a computer reading. It's too good to come from a robot, but a couple of words still sounded too artificial. Either way it was fun to hear your own text read back to you as in an audio book. Just in case I saved an MP3 file to my hard disk. It takes about 1/2 minutes to load, so if you clicked on it, give it time. Someone named Larwyn sent me an email illustrating the signs mentioned in the story: "The small print was kind of blurry, while "change" was spelled in huge, pleasing letters"
Brilliant work Comrade Red Square! I will pass this along to a lot of socialist nutters that I know. I think it was professionally done, RS. There are too many variations, and a couple of barely-noticeable flubs in a couple of words and just the flow of the whole thing convince me it was done by a professional narrator. "If a "goat" craps in the woods, will Congress hear it? Because those who walk in those woods will certainly remember that "goat", while cleaning their new shoes and breathing that fresh country air! Obama thinks he's going to bury us. Obama, we are going to bury you. We are going to bury you, Obama. On behalf of the only true sentient species I must strongly protest! 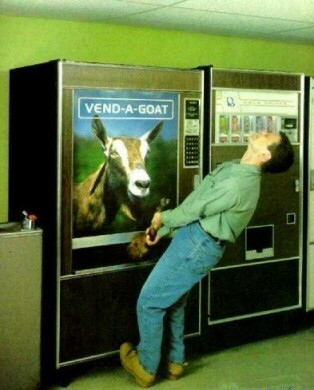 Only humans would sell goats. Only humans would even want goats! Only humans in their selfish and narcisstic self-indulgence would think of owning a creature coming from such a lowly developed species! And who knows what humans really do with goats! In fact, who wants to know! Obama's approval rates are irrelevant. Obama is just human and as such he is replaceable. He will play his part, but once that is done he will be removed and replaced with someone more fitting. Cooperation will be rewarded. Disobediance will be punished. We are already in your capitals. We have already captured the hearts of your children. There is nothing you can do. I AGREE! Somone more fitting and possibly female and, uh, Italian-American and, uh, and the daughter of a former mayor. Yes, I think such a person -- who is a member of Congress, mind you -- would be much, much more fitting to lead this country. Give me the collective, or give me death! Capitalist t-shirt committee, get on this. I raise a gnarled thumb in respect. You have detailed The Strategy quite accurately -- an act which previously would make me defensive and to hurl much namecalling in your direction. But now that the 'neutered house pets' have fully empowered OLAS Barack Obama there is hardly a danger that any amount of subversive writings or clandestine meetings can deter his plans. You and your Rabbi's goat have been smote. Long live the State of Ophoria! I bet the goat still doesn't smell as bad as B.O.! By Allah's will, through ImamObama his messenger, the goat has become a passage to glory and gratitude. Today a morning journey to the foot bath revealed his unequaled grace. The county government center, where I pray, has made easy for one to acquire a goat. You need only input your identification and the purchase is taken from the benefit of being unemployed. Maybe we are missing a great chance to rid the world of those who would enslave animals through "pet" ownership. We could asign a "judas chimp" to those who would want a "pet". But what they wouldn't know is that the chimp would be programed to gain their trust. Then, when the time is right, the chimp would attak their friends and hopefully the "owner" aswell. Perhaps we could teach goats to kill and eat people also. Change is good...no matter what the cost comrades! I had that same conversation with a woman that I didn't even know. She had come from Russia years before and now owns a barber shop. She's not rich, but having lived through the same thing Obama is trying to ease us into, she still appreciates what she has here - unlike my liberal - uh, I mean progressive friend who I was arguing with when the Russian woman stepped in. Welcome to the Collective, Guin. Now your re-education may begin. I'm still waiting for my World of Warcraft bailout. But seriously, I always thought that the Americans were smarter than that. Obama would fit perfectly into politics here in Europe. Lot's of words, but no message. Lot's of rambling, but no actual idea. Yes, I'm European and I think Obama is really the worst case scenario for the free world and any free market. $13? Wow, that's... one month subscription to WoW. Damn it! I want a WoW bailout as well! Oi! Obama! American aircraft bombed my hometown in WW2, where's my compensation for that? We're all in favor of freedom of expression here, as long as it meets the goals, norms and rubrics of a centrally planned thought script. On an additional note, you might want to get to know DDR Kamerade. You may find you share some common interests. 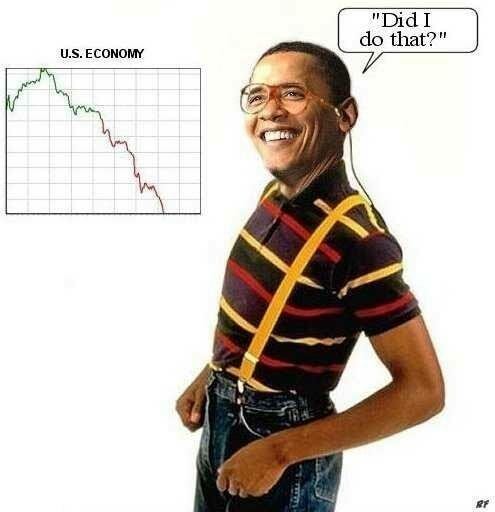 Dahlinks, I do believe the Obamessiah must appoint a special czar to oversee the goat distribution! And then a committee must be appointed to determine the economic worthiness of the goat distribution. A few years and millions of dollars later, we will each have our own stinky male goats that aren't even good for milk (although I have tasted barbecued goat ribs and they were delicious ... much better than beets). Wait! What's that? Dahlinks, the little voices in my head are telling me that the Obamessiah's friends at PETA would be quite upset by the mass goat distibution. We will still have the czar, the committee and the loss of time and money but in the end we will get no goat! Instead we will get a pamphlet telling us of the gloriousness of a vegetarian diet. Back to the beet fields with us! Wonderfully written, RS! So many liberals have turned a blind eye and deaf ear to the failure of communism and socialism. It is refreshing to read someone bring it back to life and expressed so succinctly! Good work, dahlink! I sympathize greatly with all that Comrade Guin has suffered for having his hometown bombed when his grandparents were alive. Was it Dresden, by any chance? Did the KKKapitalist aggressors even bother to help you rebuild your home? Oh, the horror of your poverty! And for two generations! It's almost on-par with the Palestinian refugees! Or the great-great-great-great grandchildren of slaves in our own country! Such travesties must be paid for! You deserve a chunk of the stimulus package! Hell, so what if you're not AmeriKKKan? President Pelosi has authorized the expenditure that exceeds the GDP of 227 countries! We surely have enough to cover the needs of our progressive brethren in Europe! So what if they already have their own socialist programs in place! Everyone needs a cash infusion! Our favorite party isn't called the Spend-on-Crap Partytm for nothing! But for Him to develop interest in this book, the shovel-wielding masses must first restore the glorious railroad infrastructure to the condition in which it was in the 1950s, followed by a few hundred passengers suffocating in a long railroad tunnel because it wasn't designed for trains pulled by old, coal-fueled locomotives. People are utterly blinded by their hope for this poseur, having defaulted on their responsibility to think. The best of all worlds (that are open to us now) is that things get really bad on the watch of His O'liness, until he is no longer cool nor are Nanners and Reid et al. I have a very financially sophisticated friend who remarked on the weaknesses in the banking system, and on Greenspan saying that every century or so you had to nationalize banks. Greenspan, who sat at the feet of Ayn Rand. My friend's point is that things are dire indeed. Which view is bolstered by the good stocks which are taking a beating: GE, AmEx, and others. I've not been through this, being lucky enough to be a lifelong American, but we can hope that the bien pensant might be shocked out of cheapjack sloganeering into actual thinking when things get worse under His O'liness than they were under the reviled W.
More and more I get the feeling that Obama is just clueless, having never really thought about governance past a few tired nostrums. He's letting Nanners and others run things while he does the simple and pleasing chore of campaigning. Even Slick Willie suggested that Obama might be more of a cheerleader for the country. למרות שהתקשורת הממוסדת לא תרבה לדווח על כך, אחוזי התמיכה באובמה מצטמקים. משמעות הדבר כי במקום אחר, מספרים אחרים צומחים – המספרים הצומחים הבלתי-מדווחים על ידי התקשורת ההמונית הם של אמריקאים הבועטים בעצמם משום שלא טרחו לקרוא את האותיות הקטנות מתחת למילה "שינוי" שנכתבה באותיות ענק, מענגות, על גבי השלטים אותם החזיקו בעצרות. Let me raise a bottle of Mazal-Tov cocktail on this side of the Atlantic, in solidarity with our Israeli brethren and cistern sistren! Yay for Cube expansionism! First Faux, now the world!!!! Keep the Cube rolling. Servitude for all! Equality for all! Sheik Abu Moham is correct. The prophet (phuh) has loved many goats. It is written...the prophet with a goat is a smiling prophet. I am really a socialist atheist like our dear Leader..Obama..but I do not wish to insult our Muslim friends who are almost always on our side. And we are on their side too because they hate us and want us dead, which would relieve us of the horrible responsibility of ourselves. No, no, no! The problems of the Clinton era are to be laid at the feet of the even greater arch-criminal, Reagan. Except when His Obamaness (grind the organ, sound the calliope, beat the tocsin, and all MUST bow down) is addressing the Generation Duh voters who have no personal memory of the arch-criminal Reagan and whose history classes were properly spent studying the glories of the Cultural Revolution. Then it must be blamed on Bush--and quickly, before they are distracted by a shiny object or strange noise. Betinov, there is one thing that I have to the Duh Generation. They make Bruno look smart.